After a week away from home I'd consider babysitting (so to speak) the perfect gift! Larry should just stop bringing home gifts. It ain't worth it! Great story, but listen here, girlie. YOUR HUSBAND BROUGHT YOU CHOCOLATE! Do you get how HUGE that is? I'm not certain, but I don't think my husband has EVER bought me chocolate. And yes, I've done the bursting into tears thing before....in the early years of our marriage, quite regularly, in fact. 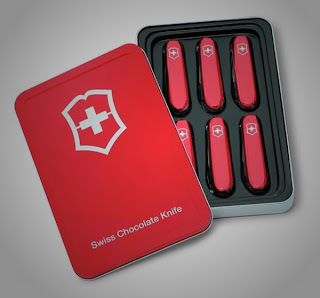 Those chocolate knives are wicked cool! Send them this way if you don't want them. But make sure they're gluten-free first, 'kay? It depends upon the country Husband has traveled to. He brought me something pretty (several somethings, actually) from Italy, and something pretty (plus the t-shirt I asked for, although it's a little small, the lech) from Australia, but from Belgium, he brought me chocolate. Because duh, it's Belgium. Was it at least GOOD chocolate? My husband doesn't bring me anything when he returns from business. Ever. Sniff. Although sardines? Wow. They're just dumb. The End. All I can think when I see that picture is to wonder if the chocolates caused any concern going through security? My husband never brings anything home from his travels, except himself and his dirty laundry. Between you and Suzie, you'll get him trained properly. If it ever occurs to my husband to bring anything it is something much more stupid than oddly wrapped chocolate. And if there was ever a whif of dissatisfaction with said wierd gift, there would never, ever be another one.